Journal of Cyber Security, Vol. 2 No. 3 & 4, 201–220. The Orthogonal Frequency Division Multiplexing-Interleave Division Multiple Access (OFDM-IDMA) scheme, which offers significant improvement on the performance of the conventional IDMA technique, has been in the forefront of recent mobile communication researches as it is expected to deliver a high quality, flexible and efficient high data-rate mobile transmission. Most papers on OFDM-IDMA scheme assume a system free of carrier frequency offset. However, the scheme is susceptible to synchronization errors and performance degradation because of the presence of OFDM, which is highly sensitive to carrier frequency offset (CFO) especially at the uplink. The effect of CFO on the performance of the scheme, in a slow fading multipath channel scenario, is therefore investigated, and analyzed. Also, the effect of CFO on the performance of the OFDM-IDMA scheme, in a fast fading multipath channel, which has not been hitherto reported in literature, is investigated and analyzed. An LMS-based adaptive synchronization algorithm is therefore employed to mitigate the degrading impact of carrier frequency offset errors on the OFDM-IDMA scheme. 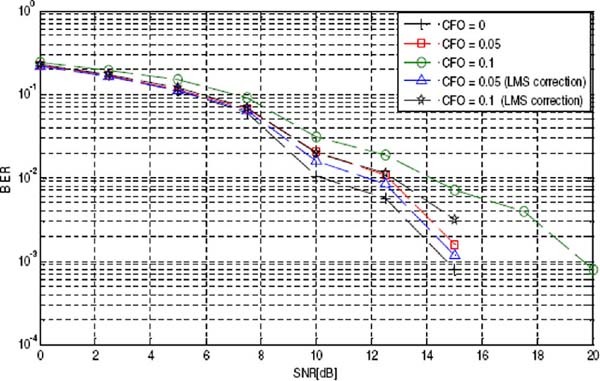 Simulation results clearly show that the presence of CFO degrades the performance of the system and that performance degradation due to CFO, increases in a fast fading multipath channel in comparison with slow fading channel scenario. Furthermore, results show substantial improvement in the overall output of the system upon the application of the adaptive synchronization algorithm, which is implemented in both slow, and fast fading Rayleigh multipath channel scenarios. The need for better quality of service, improved capacity and high data-rate transmission, which has become nonnegotiable, have informed the continuous search for a reliable and efficient multicarrier scheme. The Code Division Multiple Access (CDMA) and the Orthogonal Frequency Division Multiplexing (OFDM) techniques rank high above other multiuser schemes due to their inherent advantages. The OFDM technique has particularly become difficult to ignore and almost indispensible because of its support for high data rate transmission and the ability to suppress ISI without much difficulty. Thus, OFDM has now become the bedrock of most recent multicarrier schemes in wireless communications. 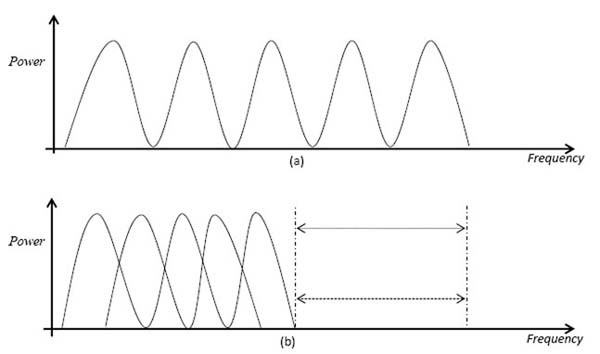 The combination of the CDMA and the OFDM technique to form a hybrid scheme of OFDM-CDMA has gained prominence and considered attractive due to the diversity and radio resource management flexibility offered. As studied in [1, 2, 3], there are various methods of combining the OFDM and the CDMA schemes, but the main idea behind the multicarrier CDMA hybrid scheme is to perform a spreading operation on transmitted signals which are then converted into parallel streams. The serial-to-parallel converted data are then modulated over different subcarriers, which are mutually orthogonal, and transmitted over the radio channel. The spreading code assigned to each user is to enable signal separation at the receiver. However, due to diverse level of fading and attenuation experienced by the transmitted signals, orthogonality is lost among subcarriers. This leads to Multiple Access Interference (MAI), causing high degradation in cellular performance, which becomes severe as the number of simultaneous users increases. In an effort to address the MAI in multicarrier CDMA (MC-CDMA), the Multiuser Detection (MUD) technique was introduced. The priority of the MUD is to subtract interfering signals from the input signal of each user in the system. However, the MUD technique utilized in MC-CDMA comes with associated complexities and high cost [4, 5, 6]. Various MUD techniques have been proposed to address the high complexity of the MUD technique, but with little success. The complexity of the MUD tends to increase exponentially as the number of active subscribers increases. Recent studies have explored the possibility of the artificial neural network for multiuser detection  but these techniques tend to compromise system performance and efficiency for reduced complexity. The MUD challenge in MC-CDMA therefore remains and there has been a continuous search for an efficient and reliable scheme with low complexity. To this end, a new multiuser scheme was recently proposed by Li Ping called the Interleave Division Multiple Access (IDMA) . This scheme employs a simple low cost chip-by-chip iterative method for its multiuser detection. The IDMA scheme, which offers a lower system complexity compared to MC-CDMA , relies solely on interleaving as the only means of identifying signals from active users in the system. In a bid to achieve an improved cellular performance of the IDMA over multipath, Mahafeno in 2006 proposed an OFDM-based hybrid scheme called the OFDM-IDMA scheme . The newly proposed multicarrier IDMA (MC-IDMA) scheme therefore combats ISI and MAI effectively over multipath with low complexity. The multicarrier scheme ensures a better cellular performance, high diversity order, and spectral efficiency compared to the MC-CDMA scheme. Thus, the scheme combines all the inherent advantages of the conventional IDMA and the OFDM technique. The associated MUD is of low cost and low complexity per user, which is independent of the number of simultaneous users in the system [11, 12]. Major studies on the OFDM-IDMA scheme focus only on the implementation of the scheme in a perfect scenario, assuming that there are no synchronization errors in the system. This is not obtainable in practice. The scheme becomes susceptible to synchronization errors because of the presence of the OFDM technique, which is highly sensitive to carrier frequency offsets (CFO) especially at the uplink, where different users are transmitting asynchronously, experiencing different levels of channel fading and delays. The CFO is caused mainly by Doppler Shifts or because of instabilities in the local oscillators . CFO causes Inter-channel Interference (ICI) and loss of orthogonality among the sub-carriers, which in turn leads to performance degradation. This paper, therefore, investigates and analyzes the impact of CFO on the general performance of the OFDM-IDMA scheme. Also, the performance of the system in a fast fading multipath channel is investigated and as well analyzed. As an extension of the performance analysis of the OFDM-IDMA scheme with synchronization errors, carried out in , an LMS-based adaptive synchronization algorithm is then introduced to combat the degrading impact of synchronization errors on the OFDM-IDMA system. Simulation results show that the performance of the system degrades as the CFO increases and the system also experiences degradation as the velocity increases in the fast fading multipath channel. An improved system output is however obtained upon the application of the LMS-based adaptive synchronization algorithm. The rest of the paper is organized as follows: Section II describes the system model of the OFDM-IDMA scheme in the presence of CFO. Section III describes the system performance in the presence of CFO. Section IV presents the LMS-based adaptive synchronization algorithm. Section V discuses simulation results and finally Section VI gives the conclusion with a summary of the major results. The OFDM technique [15, 16], which involves the splitting of high-rate data streams into a large number of lower-rate data streams, which are transmitted, while maintaining orthogonality, across multiple narrowband sub-carriers, solves the problem of inter-symbol Interference (ISI), which is encountered while transmitting high-rate data streams across multipath channels. As long as orthogonality is maintained, there will be no interference between sub-carriers and this will enable the receiver to separate signals carried by each sub-carrier. Unlike the conventional Frequency Division Multiplexing (FDM) scheme, the spectra of the different modulated sub-carriers overlap in OFDM as seen in Fig. 1(b). This makes OFDM an appropriate scheme for optimum and efficient use of valuable spectrum. Fig. 2 illustrates in block diagram the adaptation of the IEEE standard 802.11a  for a baseband OFDM transceiver. where hk (n), which is assumed to be known at the receiver, is the fading channel coefficient for user k, q(n) is the additive white Gaussian noise and the multi-user interference with respect to user k is denoted by ζk(n). 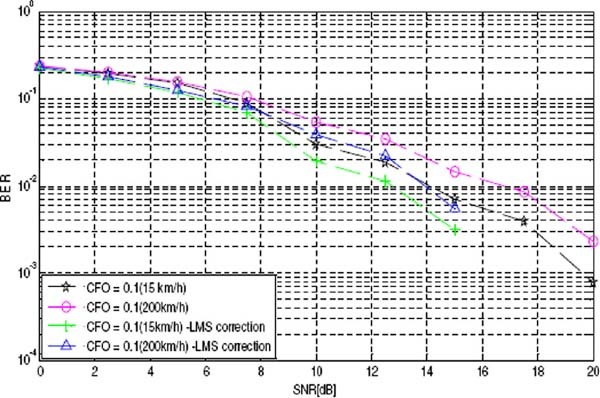 which is the extrinsic LLR about the transmitted signal xk(n) based on the characteristics of the fading channel and the a priori information of concurrent users in the system . In [25, 26], various methods for carrier frequency offset estimation have been presented and these methods of CFO estimation can be put to use in the OFDM-IDMA system. Therefore, the carrier frequency offset is assumed to be known for users in this OFDM-IDMA model. The above equations therefore represent the expressions for the OFDM-IDMA system model in the presence of carrier frequency offset. The model used combines the signal for all users at the receiver. The established presence of CFO and its degrading impact on the OFDM-IDMA system in a multipath channel should therefore necessitate the need for an effective correction and synchronization technique to improve the performance and the efficiency of the multiuser scheme. Thus, with adequate knowledge of the input data by the receiver and the update error signal obtained, the impact of the CFOs can successfully be corrected for the users in the OFDM-IDMA system. It is essential however, to state that the derived synchronization method is sensitive to the step-size as it is the case for most adaptive algorithms. Hence, the step-size μ is carefully determined  to obtain an efficient result and a reasonable convergence time. This section presents the computer simulations carried out to analyze and substantiate the performance of the OFDM-IDMA system with CFO in fading multipath channel scenario. The OFDM-IDMA system model used has four users for all instances with input data length 32, spreading length 4. The number of sub-carriers is N = 128, the number of samples in the guard interval is set at 7 and the number of iteration is 4. In practice, the number of sub-carriers N is varied to provide variable data rates for different users. However, the same number of sub-carriers is assumed for all users in the simulation for convenience. The QPSK modulation technique is used assuming operating carrier frequency of 2GHz with sampling period of 0.5 μ s. All simulation results are presented based on the bit error rate (BER)  performance of the system in a Rayleigh fading multipath channel of M =16 paths with normalized Doppler frequencies of fDn = 0.0136, fDn = 0.1085 and fDn = 0.1808 corresponding to mobile speeds of v = 15km/h, v = 120km/h and v = 200km/h respectively. 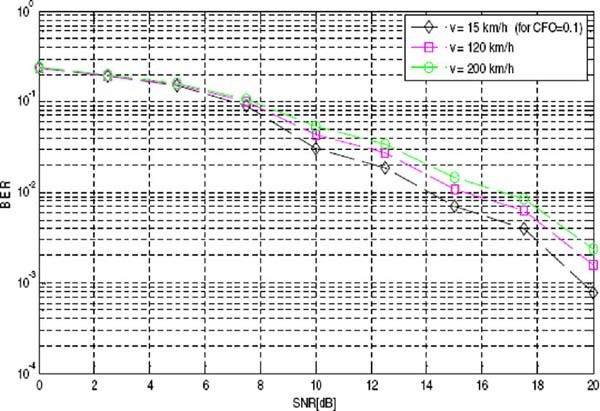 The general performance of the system is investigated for a constant slow fading scenario with mobile speed v = 15km/h and then at increasing mobile speeds v = 120km/h and v = 200km/h. In Fig. 4, the general performance of an OFDM-IDMA system in the presence of CFOs is shown. Various values of CFOs are varied from zero (when there is no synchronization error in the system) to CFO = 0.18, with the mobile speed constant at 15km/h in the fading Rayleigh multipath channel. It can be seen from the plot that at small value of CFO (i.e. 0.02), the system performance is not significantly affected. But as the values increase, performance degradation increases as well. Figure 5 shows the impact of increasing mobile speed on the OFDM-IDMA system in a fast fading Rayleigh multipath channel. The performance of the system is affected as the mobile speed is increased. It can be seen that at CFO = 0.1, with the mobile speed also increasing in a fast fading Rayleigh channel scenario, as shown in figure 5, there is significant degradation in the system performance. This means further increase in the value of CFO in the fast fading multipath channel scenario, will only worsen the performance of the system. In Fig. 6, the bit error rate performance of the OFDM-IDMA system with the application of the proposed LMS-based adaptive synchronization algorithm is presented. The plot shows the impact of the proposed algorithm on the system model in the presence of CFOs of 0.05 and 0.1. There is an appreciable reduction and significant mitigation of the carrier frequency offset errors upon the application of the proposed algorithm. This signifies an effective reduction in the ICI due to the residual CFOs of concurrent users in the multicarrier IDMA system. Furthermore, the performance of the OFDM-IDMA system model in a multipath channel of varying mobile speed is demonstrated in Fig. 7. The carrier frequency offset value is fixed while the mobile speed is varied at 15 km/h, and 200 km/h. The overall bit-error rate performance of the system degrades as the mobile speed increases. The introduction of the proposed algorithm, however, is able to mitigate the overall impact of carrier frequency offset error on the system, even in a fast fading multipath channel scenario. The performance of the OFDM-IDMA system has been investigated and analyzed in a fast-fading Rayleigh multipath channel, in the presence of CFO. Simulation results clearly show that CFOs impact the system performance adversely in contrast to many research works on the OFDM-IDMA where it is assumed that CFOs have no influence on the overall performance of the system. Also, there is further degradation of the system in a fast fading multipath channel. An adaptive synchronization algorithm, which is LMS-based, has been presented to mitigate the impact of carrier frequency offset errors on the recently proposed OFDM-IDMA scheme. The algorithm focuses on the reduction of the ICI due to the residual CFOs from multiple active users in the system. The proposed algorithm was carried out in the presence of high carrier frequency offset values for clear demonstration of its efficiency. 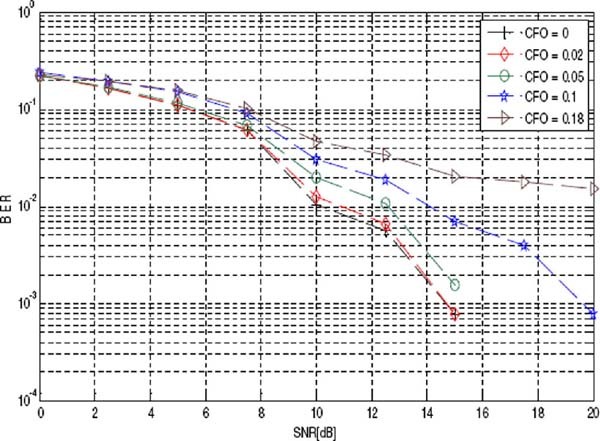 Simulation results also show an appreciable reduction and significant mitigation of the carrier frequency offset errors upon the application of the proposed algorithm in a fast fading Rayleigh multipath channel. R. L. Pickholtz, L. B. Milstein and D. L. Schilling. Spread spectrum for mobile communications, IEEE Trans. Vehicular Technology, vol. 40, pp. 313-322, May 1991. R. Prasad and S. Hara. An overview of multi-carrier CDMA, Int. Symp. IEEE Spread Spectrum Techniques and Applications Proceedings, vol. 1, pp. 107-114, Sept. 1996. A. McCormick, E. Al-Susa. Multicarrier CDMA for future generation mobile communications, IEE Electronics & Comm.,” Engineering, Vol. 14, Issue 2, Page(s): 52-60, April 2002. S. Moshavi. Multi-user Detection for DS-CDMA Communications. IEEE Commun. Mag., vol. 34, pp.124-36, Oct. 1996. D. W. Matolak, V. Deepak, and F. A. Alder. Performance of Multitone and Multicarrier DS-SS in the presence of imperfect phase synchronization, MILCOM 2002, vol. 2, pp. 1002-1006, Oct 2002. K. Rasadurai and N. Kumaratharan. Performance enhancement of MCCDMA system through turbo multi-user detection, Computer comm. and Infomatics (ICCI) 2012, pp. 1-7, 2012. F. Corlier and F. Nouvel. Unsupervised neural network for Multi-user detection in MC-CDMA systems,” IEEE Int. Conf. on Personal wireless comm., pp. 255-259, 2002. Li Ping, K. Y.Wu, L. H Liu and W. K. Leung, A simple unified approach to nearly optimal multiuser detection and space-time coding, Information TheoryWorkshop, ITW'2002, pp. 53-56, October 2002. Li Ping. Interleave-division multiple access and chip-by-chip iterative multi-user detection, IEEE Commun. Mag., vol. 43, no. 6, pp. S19-S23, June 2005. I. Mahafeno, C. Langlais, and C. Jego. OFDM-IDM Aversus IDMA with ISI cancellation for quasi-static Rayleigh fading multipath channels, in Proc. 4th Int. Symp. on Turbo Codes & Related Topics, Munich, Germany, Apr. 3-7, 2006. K. Kusume, G. Bauch, W. Utschick. IDMA vs. CDMA: analysis and comparison of two multiple access schemes, IEEE Trans. Wireless Commun., vol. 11, pp. 78-87, Jan. 2012. Li Ping, Qinghua Guo and Jun Tong. The OFDM-IDMA Approach to Wireless Communication System, IEEE Wireless Communication, pp.18-24, June 2007. M. Morelli, A. D'Andrea, and U. Mengali, Feedback frequency synchronization for OFDM applications, IEEE Communication Letter, vol. 5, pp. 134-136, Jan. 2001. M. B Balogun, O. O. Oyerinde, and S. H. Mneney, “Performance Analysis of the OFDM-IDMA System with Carrier Frequency Offset in a Fast Fading Multipath Channel, in IEEE 3rd Wireless Vitae Conference, USA, June 24-27, 2013. L. Cimini. 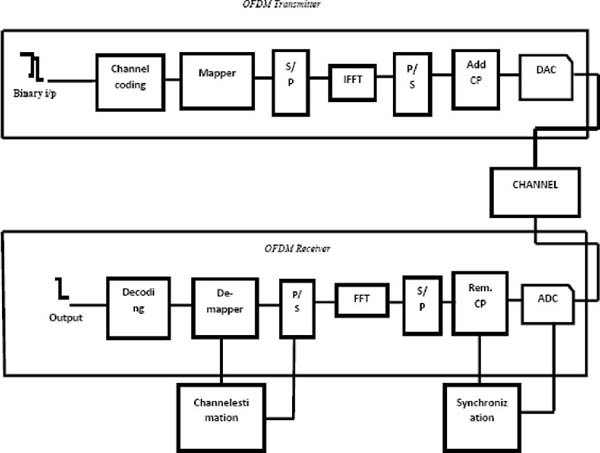 Analysis and Simulation of a Digital Mobile Channel Using Orthogonal Frequency Division Mutiplexing, IEEE Trans. Communication, vol. 33, no. 7, pp. 665-675, July 1985. A. Molisch. Orthogonal Frequency Division Multiplexing (OFDM), Wiley-IEEE Press eBook Chapters, second edition, pp. 417-43, 2011. L. Liu,W. K. Leung, and Li Ping. Simple chip-by-chip multi-user detection for CDMAsystems,” in Proc. IEEE VTC-Spring, Korea, pp. 2157-2161, Apr. 2003. K. Li, X. Wang, and L. Ping. Analysis and Optimization of Interleave-Division Multiple-Access Communication Systems, IEEE Trans. on Wireless Communications 2007, vol. 65, 1973. Q. Huang, K.-K. Ko, P. Wang, L. Ping, S. Chan. Interleave-division multiple-access based broadband wireless networks, Information theory workshop, pp. 502-506, 2006. L. Ping, L. Liu, K.Wu, and W. Leung. On interleave-division Multiple-Access, in IEEE International Conference on Communications, vol. 5, pp. 2869-2873, June 2004. L. Ping, Q. Guo and J. Tong. The OFDM-IDMA Approach to Wireless Communication System, IEEE Wireless Communication, pp.18-24, June 2007. L. Ping, L. Liu, and W. Leung. A simple approach to near-optimal multiuser detection: interleave-division multiple-access,” in Proc. IEEE Wireless Comm. Networking (WCNC 2003), vol. 1, pp. 391-396, March 2003. B. Dongming, Y. Xinying. A new approach for carrier frequency offset estimation in OFDM communication system, IEEE communication Tech. Proc., ICCT 2003, vol.2, pp. 1922-1925, 2003. M. Morelli, C. Kuo, and M. Pun. Synchronization techniques for orthogonal frequency division multiple access (OFDMA): a tutorial review, Proc. IEEE, vol. 95, no. 7, pp. 1394-1427, July 2007. A. Al-Dweik and R. Hamila, “A highly efficient blind carrier frequency offset estimator for wireless OFDM systems,” Proc. of the IEEE Int. Conf. on Consumer Electronics (ICCE '06), pp. 375-376, CA, USA, Jan. 2006. T. Peng, Y. Xiao, X. He and S. Li. Improved Detection of Uplink OFDM-IDMA Signals with Carrier Frequency Offsets, IEEE communication letter, vol. 165, pp. 646-649, May 2012. Y. Liu, X. Xiong, Z. Luo. Effect of Carrier Frequency Offsets on OFDM-IDMA Systems, 2012 2nd International Conference, pp. 209-302, 2012. L. Ping, L. Liu, K. Y. Wu, and W. K. Leung. Interleaved-Division Multiple-Access, IEEE Trans. Wireless Communication, vol.4, pp. 938-947, April 2006. T. Shan and T. Kailath. Adaptive algorithms with an automatic gain control feature,” IEEE Transactions on circuits and systems, vol. 35, no. 1, pp. 122-127, January 1988. H. Modaghegh, R. H Khosravi, S. A Manesh and H. S Yazdi. A new modeling algorithm—Normalized Kernel Least Mean Square, IEEE International conference on Innovations in Information technology, IIT 2009, pp. 120-124, 2009. E. Alameda-Hernandez, D. Blanco, D. P Ruiz and M. C Carrion. The Averaged, Overdetermined, and Generalized LMS Algorithm, IEEE Transactions on signal processing, vol. 55, no 12, pp. 5593-5603, December 2007. Y. Rahmatallah, N. Bouaynaya and S. Mohan. Bit Error Rate Performance of Linear Companding Transforms for PAPR Reduction in OFDM Systems, in IEEE Global Communications Conference (GLOBECOM 2011), Houston, Texas, December 2011. Muyiwa Blessing Balogun received the B.Sc (Hons) in 2009 from the University of Ilorin, Nigeria. He is presently studying towards his M.Sc degree at the University of Kwazulu-Natal, Durban, South Africa. His research interests include frequency synchronization algorithms for multicarrier systems, multiple antenna systems and digital signal processing applications. Olutayo Oyeyemi Oyerinde received the B.Sc. (Hons.) and the M.Sc. degrees in electrical and electronic engineering from Obafemi Awolowo University, Ile-Ife, Nigeria, in 2000 and 2004, respectively, and the Ph.D. degree in electronic engineering from the School of Engineering, University of KwaZulu-Natal (UKZN), Durban, South Africa, in 2010. He was a Postdoctoral Research Fellow with the School of Engineering, UKZN, under UKZN Postdoctoral Research Funding. He is currently a Telecommunications lecturer in the School of Electrical and Information Engineering, University of the Witwatersrand, South Africa. His research interests are in the area of wireless communications including multiple antenna systems, orthogonal frequency division multiplexing system and channels estimation, and signal processing techniques. Stanley Henry Mneney received the B.Sc. (Hons.) Eng. degree from the University of Science and Technology, Kumasi, Ghana, in 1976 and the M.A.Sc. from the University of Toronto, Toronto, Ontario, Canada, in 1979. In a Nuffic funded project by the Netherlands government he embarked on a sandwich Ph.D programme between the Eindhoven University of Technology, Eindhoven, Netherlands and the University of Dares Salaam, Dares Salaam, Tanzania, the latter awarding the degree in 1988. He is at present a Professor of Telecommunication and Signal Processing and head of the Radio Access and Rural Telecommunication (RART) Centre in the School of Engineering, University of KwaZulu-Natal, Durban, South Africa. His research interests include theory and performance of telecommunication systems, low cost rural telecommunications services and networks, channel modelling and digital signal processing applications.